Above: Taking photos out in the open air on Cumbres & Toltec Scenic Railroad. “From this point on, it’s 1880. You’ve gotten on a time machine and you’re going to be on it until we get to Chama.” With that, John Bush, president of the Cumbres & Toltec Scenic Railroad, settles into the open-air gondola car heading west in the morning chill. Next up: 11 New Mexico–Colorado state-line crossings through volcanic desert, lush meadows, and dark canyons, up to the forested mountains of Chama. From the fireman shoveling the coal that powers the engine to the spacious, wood-paneled traveling cars, the train offers daily 64-mile excursions starting on Memorial Day weekend and lasting, this year, through October 23. Its 40,000 annual riders opt to start at either Antonito, Colorado, or Chama and, from there, go halfway and turn back or take the full trip with an optional bus ride before or after to return to the starting point. If the prospect of an old-timey train ride and a Thanksgiving-type meal at the Osier stop aren’t enough to tempt you, consider the brilliant fall colors ready to bedeck the route—yellow aspens, orange oaks, and rusty sumacs. Originally built to service silver mines, the train required narrow-gauge tracks to whip around the terrain’s tight corners. Paved roads helped put the company out of business in the 1960s. Eventually, New Mexico and Colorado bought the tracks, and private donations paid for the re-creation of classic train parts, including a coach car and the high-end parlor car. Trainiacs now hope to raise $650,000 to restore an 1883 locomotive at rest in Antonito. 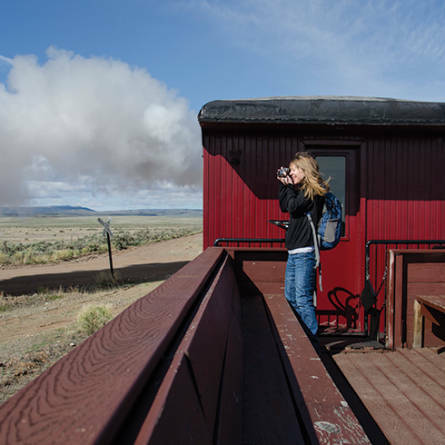 He and other Chama residents especially embrace the train, and you’ll find more than a few of them among the all-aboard staff and docents ready to share tales of the landscape’s geology and the lore of mountain railroading.